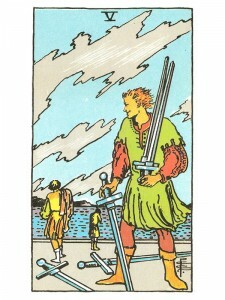 Five of Swords says you are experiencing difficulty in communicating your ideas to others – see how your mind creates doubt and pessimism which fragments your thinking. Decisions become difficult, bringing confusion and doubt as you experience memories of defeat, conflict and loss. The “image” of an enemy can refer to a real person, to an overall situation or to an “inner” feeling of inadequacy when the battle has been lost and the weight bears down heavily – resulting in weakness and a sense of humiliation. Rely on your “inner” voice now as others try to impose their ideas on you. Take a look at your thinking – your thoughts are “conditioned” from the ways society says you have not done well enough. Are your thoughts so rigid that there is no room for other opinions? One persons perception of “defeat” is another persons perception of “success”. Trust that you have the faith and wisdom to move through the fears generated in your mind and accept input from others without letting it destroy your own perspective. Consider it a means of looking at all the possibilities and rejecting none. Use your creative visualization and affirmation now – cut out the negative thinking. Trying to prove that you are right is not going to change peoples minds – you may win a point and lose your best friend in the process. When you have been hurt or injured by an encounter – you will need to heal and be made whole again. Call on the spiritual strength inside you for guidance. Great healers gain their gifts from personal wounding that has been transcended and now allows them to assist others in the same process. Activity is local, circular and repetitive rather than linear, yet is progressive. Rummaging the file cabinet of the mind, investigating, reviewing, evaluating, prioritizing. Picking up the pieces you want and discarding the rest. Looking for potential problems, but only to ferret them out, not to be negative. The self begins to become a larger self with priorities that include the extended family of loved ones and close friends. Detailed planning, contemplation, thoughts and communication flowing freely. Collecting information, experimenting with ideas – continuing education, but only to flush out your existing fields of knowledge – nothing drastic or new. Mental patience, appropriate worry, sadness or disappointment as you prepare for next vital move. Next to Magician: You are misusing your abilities – do not become overconfident – reconsider any recent decision. In the first position: While others may be involved in unproductive play or bogged down in monotonous routine, you are skipping delightfully down the middle of them both, serious about your leisure and lighthearted about your work. You must make all the minutes count. Centered so thoroughly in the now, what many others overlook, your keen eye picks up with ease. You are a master at choosing, at selection. A keen judge of character. In the second position: Your file cabinet or its equivalent is what you rely on to make your living. There is always an idea, a solution in your bag. You can jettison a losing position quickly in favor of a better solution. Your quickness of mind enables you to keep many irons in the fire. This archetype serves well the researcher/experimenter. In the third position: It may be a mental holiday, but you had better take your homework along. A time for editing. How to make the past relevant to the future? For now, forget the long – range plan. Use one interim plan after another. Concentrate on the short term. In the fourth position: Your passion for mental exchange, conversation, debate, critique leads you by the nose. Your fascination with language and communication serves you well in your relationships and hopefully this talent is being used professionally. This archetype serves well the newspaper reporter. God bless your supportive mate and family. In the fifth position: The mind thinks of itself here – how to improve, to better satisfy its goals. With what does it want to spend its time? Brainstorming an idea or project without a pressing deadline. Mental leisure is at the top of your agenda. In the sixth position: You are to be given breathing room in your mental affairs in the near future. Those normally around you may not be as pleased with your new circumstances are you are, but the pause is what you need to shore up these relationships. The resulting adjustments will bring improvements. In the seventh position: The advantage of a pause will give you time to beat the bushes and shake out the cobwebs before pushing on toward your main goals. In the eighth position: Mental projects for which you care a great deal are stagnant, maybe even ending or already finished. Research, re – education, journals/histories/autobiographies, critiques, debates – these are what can suffer in such times. You are dealing with these issues well. In some cases, you may actually be relieved to be free of these projects. In the ninth position: The mind swirling in the Emotional Plane. Heart’s priority is on your mental situation, concerned about your progress toward goals of the ego. In the tenth position: You will be given the break, the freedom you need to reorder your thoughts, to pick up the loose ends. Any ideas inappropriate to your karmic path will no longer impress you as you see them in a new light given this additional time. Are you referring to the ten positions of the traditional celtic cross?